This is Hairy Larry inviting you to enjoy Something Blue every Saturday night at ten. This week we’re featuring Suzanne Michell, Stephan Siebert, Fred Hersch, and Randy Weston. For more about the show visit the Something Blue website at http://sbblues.com. All right now, three bonus tracks from Suzanne Michell’s “Winter Interlude” CD. we heard “A Day In The Life Of A Fool”, “God Bless The Child”, and “Tenderly”. Suzanne has an amazing touch on the piano. I’m Hairy Larry, host of Something Blue. 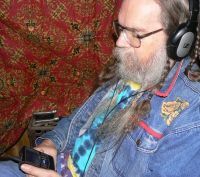 Visit the Something Blue website at http://sbblues.com for clickable links to more music and to listen to the shows anytime. I found Stephan Siebert on the Free Music Archive and I really enjoy his jazz piano work. We’ll hear three of his compositions, “Become”, “Die Frau In Schwarz”, and “Afrika”. Then we’ll hear Fred Hersch play “Down Home”. Now that’s what I’m talking about, Fred Hersch playing “Memories Of You” and “Work”. I’m Hairy Larry, host of Something Blue. Friend me or message me on Facebook or on the Delta Boogie Network at http://deltaboogie.net. To hear my jazz piano compositions visit my band’s website at http://bebopbeatniks.com. Closing the show we have two songs from Randy Weston. Here’s “African Village Bedford-Stuyvesant 1” and “The Healers”. This entry was posted in Shows and tagged Fred Hersch, Jazz, piano, Randy Weston, Stephan Siebert, Suzanne Michell. Bookmark the permalink.